We raved about the auto-everything Fujifilm F10, so when we heard that they were producing an updated version of the camera offering more manual controls, we were happy to dust off the chequebook and place an order. As with the F10, the camera features a class leading sensitivity of ISO 80-1600, courtesy of Fujifilm's 'Real Photo Processor' technology. We remain impressed with the results, with the high ISO rating letting us capture natural-looking images where other cameras would be reaching for the flash or crumbling into a noisy mess. Once again, we liked the overall speed of the camera, with a swift start up time, fast focussing and negligible shutter lag reducing the chances of missing a vital shot. Although we welcomed the extra control afforded by the new aperture and shutter priority modes, we did get a bit frustrated with the interface. 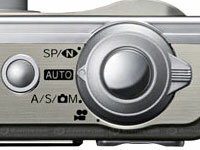 With no new dedicated controls to control aperture and shutter settings, exposures had to be adjusted through a rather clunky interface that involved doubling up the main four-way controller and central MENU/OK buttons - not always without confusion. Some other niggles remain too: we don't like the way the LCD display briefly turns off when the flash is charging nor do we like Fuji's annoying 'breakout box' that users have to drag about if they wish to charge up the camera. But overall, the camera continues to impress, and produced excellent exposures throughout our tests (although minor problems with purple fringing remain). For folks seeking a simple, all round point and shoot camera, the F10 remains our first choice, but for photographers keen to take advantage of Fuji's outstanding low light abilities with the ability to control exposure manually, the F11 is well worth the extra �30 or so.